With its legendary styling and zippy performance, the MINI Cooper Convertible is one sun-seeker that proudly stands out in a crowd. So it comes as no surprise that the MINI Cooper Convertible was chosen as a contender on Edmunds’ Consumers’ Favorites Poll of Best Convertible 2012. 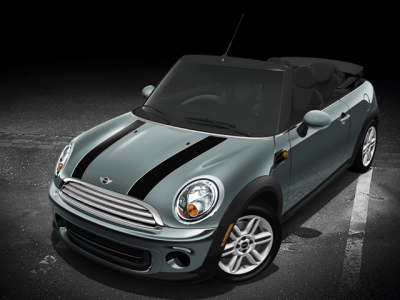 The MINI Cooper Convertible is waiting for you now at MINI of Pittsburgh. This two-door convertible features a retractable soft top as well as a power tilt/sliding sunroof for days when you don’t want quite as much sun. With the ability to seat four passengers and an EPA estimated 27 mpg city/35 mpg highway, the MINI Cooper Convertible is ready and able to take you and your gang on long road trips or quick commutes around town. Standard amenities include cruise control, an auxiliary power outlet, leather wrapped steering wheel with mounted controls, a trip computer, MP3 player, and satellite radio. Optional convenience features include climate control, navigation system, rain sensing wipers, HID headlights, a premium sound system, and keyless start. The 2012 MINI Cooper Convertible received a five-star rollover crash rating from the National Highway Traffic Safety Administration. Five stars is the high rating obtainable. Safety features include brake assist, electronic stability control, traction control, driver and passenger air bags, and 4-wheel disc brakes. Enjoy the many colors and beautiful scenery of fall with the top down on a MINI Cooper Convertible from MINI of Pittsburgh. Visit our dealership on Baum Boulevard in person or online at www.miniofpittsburgh.com.